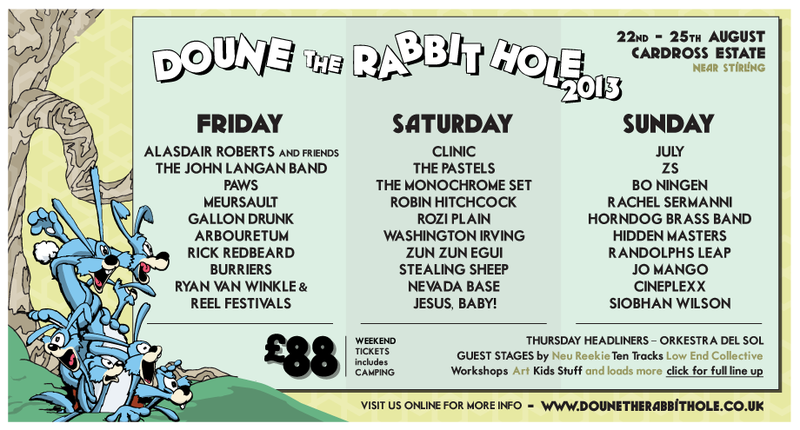 Leaving the picturesque vista of the Duncarron Valley and forgoing the relative safety of the Fort, Doune The Rabbit Hole returns this August to delight us with a brand new venue and stellar line-up. This year the Rabbit Hole which we shall crawl down for another magical lost weekend is situated in the beautiful Cardross Estate nestled near the Lake of Menteith not a million miles away from Stirling. As you can see from the poster above the hard working organisers of DTRH have yet again outdone themselves in bringing a bountiful supply of talent to the stages over the duration of the festival. Personal favourites include the howl of Neil Pennycook’s Meursault, the throbbing energy of Paws and the sublime songwriting prowess of Rick Redbeard, and that is only Friday nights entertainment. Other gems across the weekend include Rozi Plain, Washington Irving, Rachel Sermanni, Randolphs Leap and Siobhan Wilson. If the festival is even half as good as last year then you are in for an absolute treat.